County officials across metro Detroit used tens of thousands of dollars in campaign cash to throw lavish parties, dine at upscale restaurants, buy gifts and flowers, and entertain in luxury suites at professional sporting events, a Free Press review of campaign spending records shows. 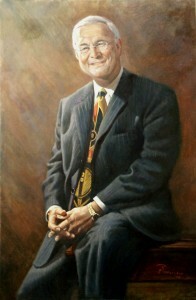 Oakland County Executive L. Brooks Patterson spent $5,735 from his war chest to have his portrait painted. Macomb County Public Works Commissioner Anthony Marrocco leased a car with his funds. And Macomb County Prosecutor Eric Smith rented space in his mom’s home for a campaign office. Officials in the three counties defended the expenses as keys to getting their names out to the public and serving their constituents. A separate Free Press review last year found that state lawmakers similarly spent campaign cash on cars, jewelry, entertainment and expensive gifts. And Bob Stern, president of the Center for Governmental Studies, said Tuesday that Michigan’s law is too vague, making it easy for public officials to pass off their expenses as campaign-related. Still, he said, roughly half of the states don’t restrict how public officials spend campaign cash. And in North Dakota, officials don’t have to report their expenditures at all, he said. Michigan law gives candidates wide leeway in how to spend their contributions. In addition to campaign-related expenses, elected officials may use the money to cover expenses related to holding office. Officeholder expense accounts funded by donors were outlawed by the state Legislature in 1994 because of abuse. John Grace, a Rochester Hills attorney who said he has made many political contributions over the years, said he wishes tighter reins existed on campaign spending. Patterson and Oakland County Prosecutor David Gorcyca used campaign cash to pay for meals on a regular basis. Patterson spent $16,724 on meals from Detroit to Ft. Lauderdale, Fla.
Gorcyca had regular dinners at the swanky Capital Grille and Palm Restaurant in Troy, the new Cameron’s Steakhouse in Birmingham, and the Royal Park Hotel in Rochester. Gorcyca, who announced shortly after the 2004 election that he wasn’t running for re-election, raised $57,967 during the period under review. He spent $9,245 on meals. Since the Legislature banned expense accounts, Gorcyca said he has no choice but to dip into his campaign fund for dinners and meetings. “It’s not out of the ordinary. It’s the standard course of business,” he said. Patterson spent a good portion of the $210,000 he raised on gift certificates to places like the Capital Grille, the Lark restaurant in West Bloomfield, and the Capelli Spa in Bloomfield Hills; and gifts at the Goldner Walsh Nursery in Pontiac and Marshall Field’s. Patterson is a big fan of Dominic Pangborn’s colorful ties, and he spent $3,300 on a staff Christmas party at the Detroit designer’s store. He also paid for a portrait by Grosse Pointe artist Robert Maniscalco. It hangs in the county’s Executive Office Building, next to a painting of former County Executive Dan Murphy. The review of county officials covered money spent between November 2004 and Dec. 31, 2005. Marrocco leased a 2002 Chevrolet Monte Carlo, paid his insurance and bought license tags with more than $5,000 in campaign cash. He spent $12,000 on gifts and meals at upscale restaurants for developers, friends, politicians and constituents. Marrocco also used $6,252 in campaign cash to throw Christmas parties for employees and county commissioners. “They’re all legitimate expenses. It’s stuff I just wouldn’t spend money on if I wasn’t the public works commissioner,” Marrocco said last month. Wayne County Executive Robert Ficano entertained union and business leaders in luxury suites at Comerica Park and Ford Field, spending $7,582 on food and drinks. Ficano, who raised about $625,000 in the period reviewed, didn’t return calls for comment, but his spokeswoman, Sharon Banks, said the guests have business interests in the county. She declined further comment. Smith, who is not up for re-election until 2008, rented an office in his mother’s Clinton Township home to run his upcoming campaign and paid her for bookkeeping and food. The total bill: $6,000. He raised more than $95,000 in the 13 months covered in the review. Smith declined numerous requests for comment. Oakland County Sheriff Michael Bouchard spent $4,000 on motor home rentals in January and July for campaigning. He also paid nearly $10,000 to the Heathers Club, a private country club in Bloomfield Hills, for a fund-raiser, additional meals and expenses and $1,400 in monthly dues. That expense was necessary, he said, because he holds campaign events at the Heathers and needs to be a member to book the facility. “Everything I do is campaign related,” he said. Kelly Chesney, a spokeswoman for the Michigan Secretary of State’s Office, which oversees state elections and campaign finance disclosures, said the office occasionally flags questionable expenditures as part of routine reviews. Complaints by residents can also lead to reviews, but they happen less often, she said. Using campaign finance funds to pay for incidentals such as meals and flowers is not all that uncommon, but that doesn’t necessarily make it right, Robinson said. “Wouldn’t it be a novel idea if officeholders would use their own salaries for their expenses,” he said. *Wayne County Executive Robert Ficano: $7,582 for food in luxury suites at Comerica Park and Ford Field. *Macomb County Public Works Commissioner Anthony Marrocco: $5,026 to lease a car and buy tags and insurance, and $6,252 to throw Christmas parties. *Macomb County Prosecutor Eric Smith: $6,000 to his mother for rent, food and bookkeeping at his campaign office in her home. *Oakland County Executive L. Brooks Patterson: $16,724 for meals and $5,735 for a painted portrait of himself. *Oakland County Prosecutor David Gorcyca: $9,245 for meals, including 15 outings to the Capital Grille in Troy. *Oakland County Sheriff Michael Bouchard: Nearly $10,000, including $1,400 in monthly dues, at the Heathers Club, a private country club in Bloomfield Hills. Records showing who donated to candidates for local and county offices in metro Detroit, and how the money was spent, are available for public viewing. For Macomb County records, go to http://campaignfinance.macombcountymi.gov. Wayne County’s records can be viewed on a computer in the elections department on the fifth floor of the Coleman A. Young Municipal Center, 2 Woodward Ave., Detroit. Paper copies of Oakland County’s records are on file in the elections department on the ground floor of the county complex, 1200 N. Telegraph in Pontiac. State law gives candidates broad discretion in how they spend their campaign donations. The money can be used for flyers, yard signs and phone banks, as well as so-called incidental expenses related to the cost of holding office. Those may include office furniture, professional fees and travel expenses. Contact STEVE NEAVLING at 586-469-4935 or sneavling@freepress.com. Caption: Macomb County Prosecutor Eric Smith paid his mother $6,000 as part of putting his campaign office in her home. Wayne County Executive Robert Ficano spent $7,582 entertaining business and union leaders at sporting venues.